What we are making now? In our previous blog we have been able to get our SAPUI5 hello world pod up and running. This was a single pod running our basic application. Now the plan is to integrate with a database which is also hosted as a separate pod. So in this blog we will try to get our MySQL database pod running along with a separate PHP pod. The MySQL pod will not be exposed to the outside world, PHP pod will internally talk to MySQL pod and expose the data via API. So we will have 3 pod’s running with our SAPUI5 app and PHP pod accessible to the outside world and database pod which can only communicate internally among pods and containers. We have our MySQL pod running, let’s create a service which will be used to interact with the pod. This service is of type clustered ip meaning it can be accessed only internally inside the cluster. Now our database pod is up lets login and create a database tables saledocument with some entries. Like in our first blog we have created an image for our SAPUI5 application, we will be creating the docker image this time via docker file. In the file below we have mentioned the php image version, then add mysqli plugin, copy our PHP code and expose pod 80. Rest of the steps are the same as we did in part 1. The PHP endpoints returns the data fetched from MySQL database. Our updated docker image pushed to the docker hub. Next step is to create deployment and service for this PHP image. Now we have our PHP pod and MySQL pod up and running, but how will they interact, read on! How will MySQL pod talks to PHP pod? 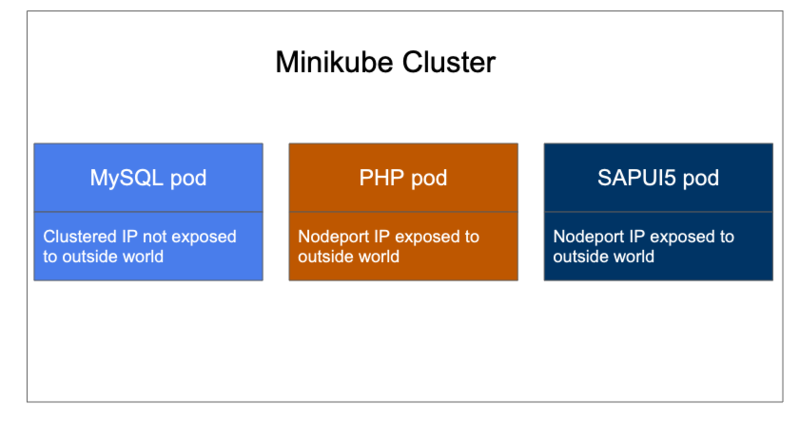 As of now the PHP pod is exposed as Nodeport IP so external world can access it but not MySQL. How will MySQL talk to PHP, if you look the PHP code for making the connection the host is mentioned as nothing but MySQL service name, so basically we access pods internally via service name. If you remember our SAPUI5 app has only basic Hello World stuff, we have modified the app to add a list which will show the sales document data fetched from MySQL via PHP api. Now we have all three pod’s running with our SAPUI5 app consuming the PHP endpoint. Containers is a vast topic, i have also been trying to understand more and more. 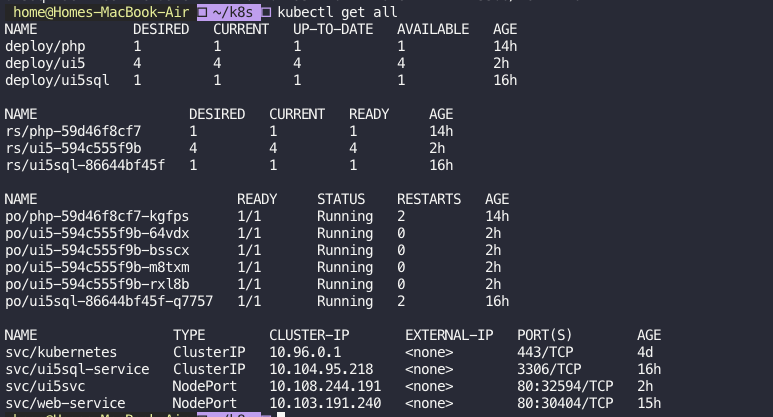 In future blogs we will again build on the same app to add more features of Kubernetes such as ReplicaSet, Config and Maps, Persistent Storage( the moment i delete the pod the database changes will be lost), RBAC etc. Great job Nabheet, as always! It would not be me if I didn’t ask… Is running locally and shortage of RAM the reason not use our favorite database (HANA) here?